The United Kingdom looks to be getting back on track. 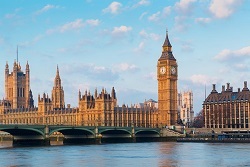 Recent UK economic growth numbers this week revealed that UK GDP is expected to grow 0.7% in the second quarter. With so much focus on the Greek debt crisis, little attention is paid to UK economic growth numbers. That's despite the fact that the UK is grappling with many of the same issues as the United States right now. You see, in the same way that the U.S. Federal Reserve stepped in with accommodative monetary policy following the global financial crisis, the Bank of England also lowered rates and embarked on a quantitative easing strategy. The asset purchase facility was financed with the creation of £374.9 billion ($585.9 billion) in bank reserves starting in February 2009. Most of the major purchases ended by October 2012. Armed with the new UK economic growth expectations, the BOE's Mark Carney faces a similar conundrum as U.S. Fed Chairwoman Janet Yellen. When should interest rates go up? When will the BOE begin selling off the £374.9 billion in assets and start to put upward pressure on low 0.5% UK interest rates? The BOE has to face the same reality that the Fed is now confronting. Namely, that QE really only propped up the stock market. It didn't actually deliver the economic medicine to consumers that was intended. It's a feel good policy aimed at creating a "wealth effect" for consumers, who are somehow goaded into spending when they read the financial headlines touting new market highs. The UK stock market – the Financial Times Stock Exchange 100 Index (FTSE 100) – is up 58.3% since the BOE QE efforts began. The Dow Jones Industrial Average is up 110.7% since the Fed started employing QE in November 2008. So while the UK economic growth numbers are encouraging, they hold a mirror up to the United States' current issues. When will the party end? When will central bankers take away the punch bowl? And how will the UK stock market react once the BOE stops leaning on the easy money spigot? The Bottom Line: The UK economic growth numbers show that the UK is emerging on solid footing from the global financial crisis. But, like in the United States, the easy money regime is going to have to end. And that calls into question whether the UK stock market can continue to march up as it has over the last six years.